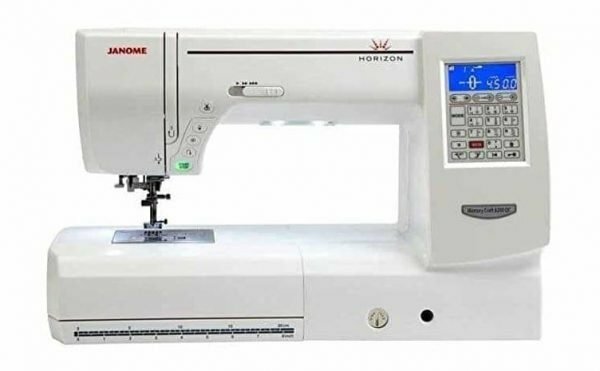 I often get asked for advice about which sewing machine I recommend for patchwork and quilting, and particularly for making memory quilts or other keepsakes from loved ones clothing or baby clothes. In this post, I’ll try and answer that question and hopefully give you a few helpful pointers if you’re looking at purchasing a new machine. I started sewing on my Mum’s old ‘Jones’ machine (I still have it tucked away in the studio!). It’s one of those very solid machines, with basic features but a really strong sewing mechanism. It also weighs an absolute ton, which is a curse if you want to lift it but brilliant for not shifting about when you are sewing. When I came to buy my own sewing machine it was quite overwhelming. There are so many sewing machines available, and I was really concerned about spending a lot of money and ending up disappointed. I wanted to buy a machine that would help me explore my new love for sewing with confidence. I wanted to buy something that would do all the key things I potentially needed (even though I wasn’t quite sure what they were! ), and last me a good long time. I’m sure this is not uncommon, and you may be in a similar position. Even if you’ve done a fair bit of sewing, the world of patchwork and quilting can add a whole new layer of things to consider. If you are planning on doing any quilting then as a minimum you’ll need a machine that does a good straight stitch (preferably with adjustable stitch length) and is strong enough to deal with multiple layers of fabric. If you have access to a sewing machine, or can borrow one, then that’s a great place to start. Any good basic domestic machine should work fine for making patchwork quilts, especially smaller sized ones. There’s no need to rush out and buy a new machine until or unless you have a good idea what features you’d like. I’ve suggested some features that are really helpful to have below. adjustable stitch length – so you can use a long temporary tacking stitch, or a very short stitch length for tricky fabrics. adjustable foot pressure – so the machine’s speed will depend on how much you push on the foot pedal. I’d go nuts if my machine didn’t have this feature as you are either on at one speed or off! adjustable stitch width – really useful to get that perfect 1/4 inch seam allowance, so important for accurate patchwork. If you don’t have this then you’ll have to achieve it solely by moving the fabric. automatic needle up/ needle down setting – this allows you to tell the machine to always stop with the needle down through the fabric layers. It’s really helpful when joining patchwork pieces and even more so for quilting, as it keeps all the layers where you want them. adjustable speed control – as it suggests, this means you can tell the machine the maximum speed you’d like it to run at. If you are a less experienced sewer this can be super helpful and prevents the machine running away with you. auto thread cutter which works at the touch of a button, saving you having to dig around under the quilt when you are stopping and starting your quilting lines. This was a revelation to me when I bought my current machine, and I wouldn’t want to be without it now. automatic needle threader – just handy! automatic bobbin winder – there are machines where you can wind the bobbin without un-threading the machine – this sounds like heaven to me! Here’s some recommendations at different price points. 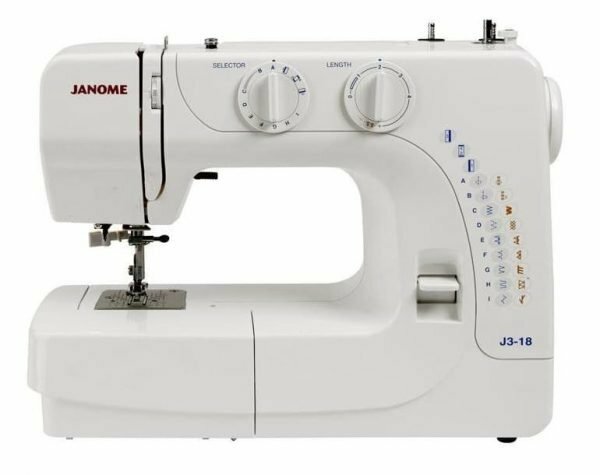 I can only really talk about Janome brand machines as they are the ones I am familiar with. Bernina seem to be a very highly rated brand in the quilting world, but they come at a (very) premium price tag. There are other brands available and worth exploring. Also worth noting – unless your machine comes with them, quilting accessories like a walking foot will be an extra cost, and it’s worth checking out availability and pricing of any accessories you might want before you buy the machine. 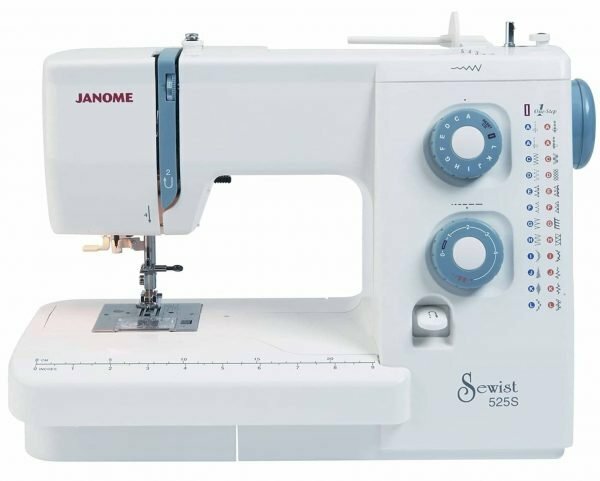 The Janome J3-18 is a lightweight sewing machine. This is a basic machine, that would be good for a beginner, or if you don’t want to spend too much. It has a front loading bobbin case, built in needle threader, variable stitch length (although not variable width) and extra presser foot lift for heavy fabrics (or quilting). The Janome 525S is really popular model which won a major consumer magazine award for “Best Buy”. It’s also the machine used on The British Sewing Bee! It has a good range of features and is perfect for both beginners, and those who are more experienced. It has stitch width and length controls, an automatic needle threader, adjustable foot pressure, a hard protective cover and a bunch of other useful features. It’s a great all round machine at a good price. It would be my recommended purchase if you’d like to get into patchwork and quilting. 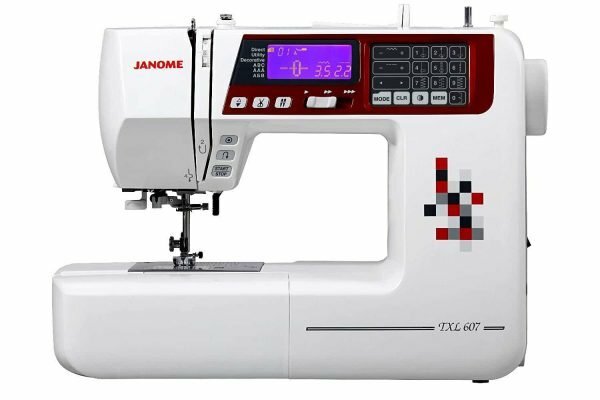 The Janome TXL607* machine is a great investment buy, and will set you up really well for most domestic quilting projects (as well as other home sewing). One of our patchwork quilt makers has this machine and absolutely loves it, although doesn’t like to quilt anything bigger than a single size quilt on it. It has lots of nifty features including a superior feeding system for fantastic fabric handling and an auto thread cutter which works at the touch of a button, saving you having to dig around under the quilt when you are stopping and starting your quilting lines. Other features include an automatic needle threader and speed control slider. It also comes with a full quilting kit, including a walking foot, extension table, 1/4″ foot and a free-motion foot – all really worth having, and no need to source these as extras. This beast of a machine is the latest version of the machine I use to create our gorgeous memory quilts. It’s quite simply fabulous! It’s big and solid, and has a HUGE space to the right of the needle which makes quilting the larger quilts much easier. The built-in AcuFeed system is just brilliant for sewing tricky fabrics and quilting, and it has an impressive top speed of around 1000 stitches per minute. There’s loads of bells and whistles on this machine, but it’s definitely a luxury purchase for the home sewer! We’ve run through the features that I find most useful on my sewing machine for patchwork and quilting, and some suggestions to get you going if you’re looking for a new sewing machine. I’d love to hear your thoughts. 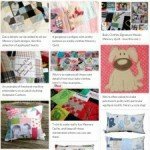 Sewing machine options are a regular feature of the conversation on our Baby Clothes Memory Quilt Tutorial Facebook Group, and for those considering making their own clothing keepsakes. Please do add a comment if you have any questions, machine recommendations or other useful suggestions.